Remember to secure any pets and have young children looked after! Prop the screen door open. An old school moving rubber band works well tied to a railing, or lean a dolly against it or heavy door mat. 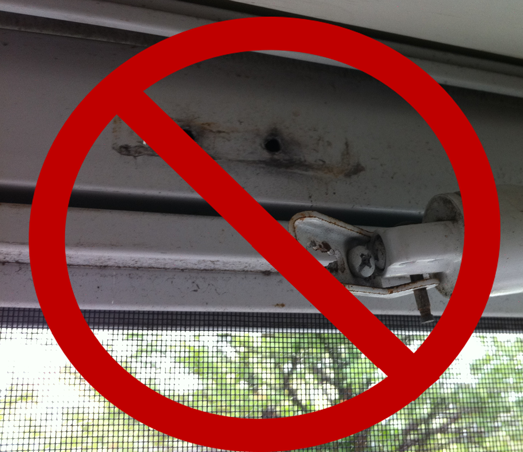 Screen door are usually too high to be held in place by a door chuck. Use a door chuck to hold open the main door. “Professional” movers unscrewed the bracket holding the piston. In the process they stripped the screws. Plus it took longer and caused a damage. Apartment buildings often have service entrances with doorchucks or hooks to secure doors. For the DIY mover you probably don’t have a moving rubber band or rubber mats. You may buy carpet mask/carpet shield from your local home improvement center, Lowes, or Home Depot to protect that brand new white carpet. If you are really worried about dirt getting tracked in, you can request the company use booties to cover their shoes. This only works if some of the crew stays inside the home with booties on their shoes while the rest of the crew places the furniture and boxes at the entryway. This in inefficient and will add time and cost to the move. 1)I once had a client station their father at the door on a chair to open and close the door to open and close it to keep the air conditioning in at an offload with 5 movers. Kinda ridiculous – like a doorman at Macy’s on Christmas Eve. kinda ridiculous. And it added time and could have caused a damage. 2) I was once on a move in the Fall. There were many leaves outside on the walkway. And as it turned out, dog feces as well. We discovered that out when it was tracked into the home.